Geezus Fi, I'm going off like a car alarm here! I'm fluorescing so much I got PLANES landing on me so I do not need your comments on my well-being thankyouverymuch. And while we're on the subject, quit telling me my batteries are low. These are the only batteries I've got and as soon as they stop working, they're going to get taken out, rolled around and put STRAIGHT BACK IN AGAIN. Also, quick question: what did you make this on? Flash? You can do that with batteries? How long does it last after that? This is so freakin true. Every. Single. Time. LOL Gotta love those Zelda games with those super annoying "helpful" characters in them!! I never played the game, but I can understand why it's annoying. Just trying to make sure your 2000% aware. if I get this game, I will pray that there's a mute button for her. Midna was at least interesting. At least Navi was only annoying in the second play through...mostly. Someone should tell him that he's low on health. Because we clearly can't tell that our screen is flashing and we only have one heart left. We clearly can't see that. The developers clearly underachieved with the whole low-health-warning thing. Maybe a small cadre of NPC assistants would've sufficed? Or maybe.. a very loud voice yelling: YOU ARE LOW ON HEATH PLEASE HEAL YOURSELF OR YOU MIGHT DIE!! and that's why i always carry health potions... because that darn sound annoys me to no end. One can not comprehend the complete agony Link is currrently experiencing. why do I hear an alarm sound when I see this? Hehehehehe! I get the theme here, plus the effect coming from the gif is awesome. 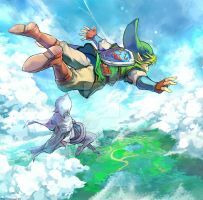 Wow Fi...You don't have to try being more annoying then Navi. I would have thrown the master sword away if only I did not need it to kill Demise. Adding this to my faves for the battery comment. I seriously laughed out loud. Excellent work, my friend. This annoying miss makes Navi tolerable. 98% of the time, I so wished I could be given the option kick her holographic face in.